Toronto’s HSY (pronounced “hussy”) are heavily indebted to the noise, sludge, and punk of the ’80s, but despite the three decade old influences, HSY feels of its time. Maybe it’s because it’s becoming so commonplace to pull from those sounds today (METZ, Pissed Jeans, California X, etc), but also because there’s not really one specific scene you can imagine them coming from. 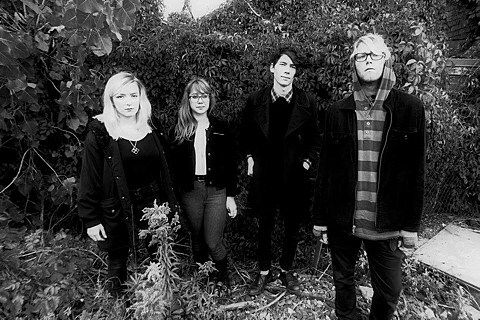 HSY is partially Seattle Sound (a la Mudhoney or Bleach-era Nirvana), but you can also hear the basslines of Vancouver’s Nomeansno and the angry sarcasm of late-period Black Flag. HSY will bring these sounds together on their new 6-track self titled 7″, which is due out on September 17 via Buzz Records. For now, you can watch the video for one of its tracks, “Milk Chug,” and stream another, “Tartar Mouth,” along with the artwork and tracklist, below. HSY will be doing some shows following the 7″s release, mostly in Canada, but one in NYC on September 21 at Death by Audio. That show is with fellow Toronto band/Buzz Records labelmates Odonis Odonis and local Brooklyn goths Eraas. Admission is $7 at the door.